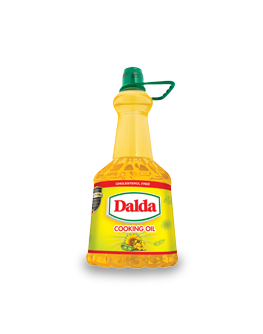 Dalda Cooking Oil is a premium blend of canola, sunflower and soybean oil, which is then hygienically refined to perfection using Dalda’s state of the art plant and International Technology and Expertise. This process of refining is specially designed to preserve the natural goodness of each of the individual oils in the blend. Hence the optimum goodness of each canola, sunflower and soybean reaches the consumers. 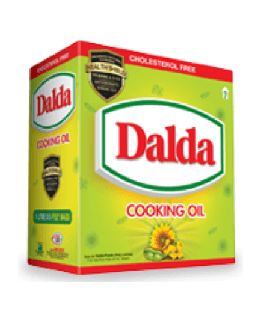 Dalda Cooking Oil is 100% cholesterol free and contains Vitamin A and D together with Vitamin E which protects from skin and heart diseases. It also contains essential fatty acids, Omega 3 and 6 and natural antioxidants that boost the immune system of the body. Thus food cooked in Dalda Cooking Oil is not only delicious but also exceptionally nutritional.